A fluttering purple butterfly hovers towards pink and blue pansies atop a lovely glass heart with hand inscribed red letters of LOVE. A touching gift or anniversary favor to warm the heart. Use with an LED light base to make this figurine special. 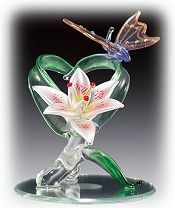 This hand crafted crystal and spun glass gold butterfly is perched on an elegant leaf heart over a frosted pastel tropical Lily with yellow and red calyx for a sip of enticing nectar. The arrangement sits on a round glass mirror base that can be illuminated from below with an LED light base. 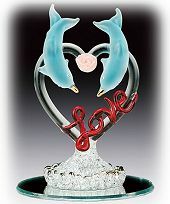 Dolphin sweethearts frolic over a crystal heart with red letters of Love under a pink rosebud. 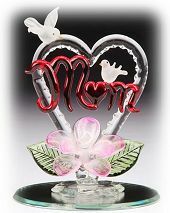 This lovely hand crafted gold accented figurine sits on a round glass mirror base and adds romance to any occasion. A perfect gift or wedding favor, place over an LED light base for added effect. A pair of luminous Blue Birds flirt over a lilac rose. 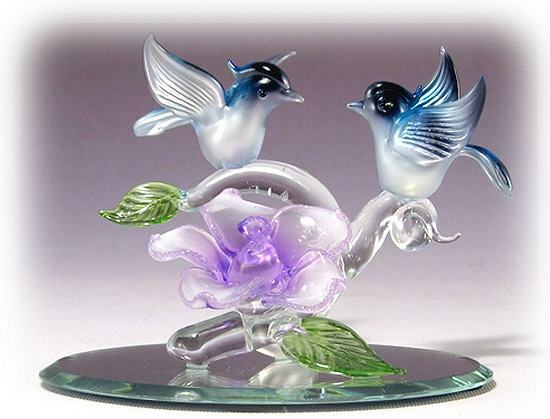 The spun glass Blue Birds have pearl tinged bodies and crystal eyes as they perch on a leafy stem. Beveled oval mirror base is included. 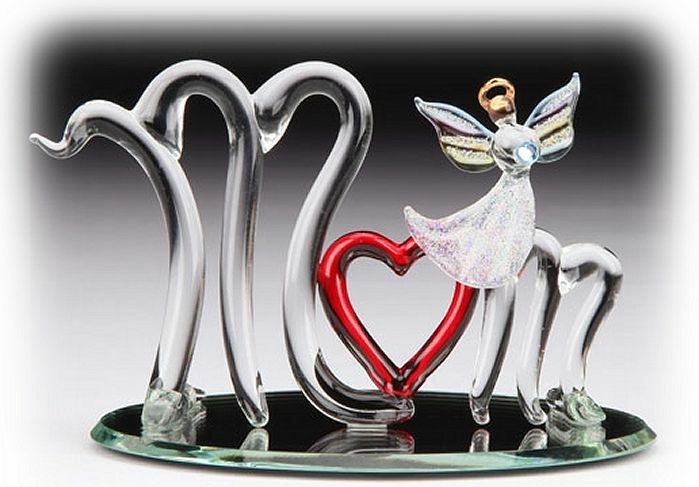 Graceful spun glass swans float serenely on a reflective pond mirror base. The swans have pastel blue and pink wings with gold accented beaks. A large red rose with clear green leaves completes this romantic picture. An enchanting gift or wedding favor. 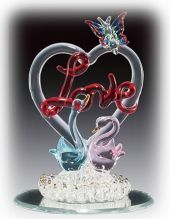 Delicate pink and blue Swan pair are set under a romantic heart and a graceful rainbow colored butterfly friend. This romantic scene is set on a round glass beveled mirror base which can be illuminated from below with a light base. This is a touching hand crafted gift or wedding favor. Adorable pink frosted angel holds a Ruby crystal heart and is next to a delicate glass heart with a pink ribbon bow. "LOVE" is beautifully hand written in red letters, all set on an oval mirror base with beveled edge. This is a romantic birthday present or touching gift of friendship. "Mother, you fill my life with happiness and my heart with love". A welcoming angel with translucent white robe has a beautiful poem to Mom transcribed on it. 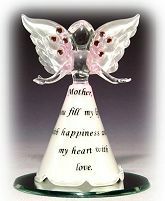 This delicate angel is 4" high and features translucent milk white wings with pink accents and 8 pink crystals. This sculpture is set on a beveled round mirror base with a clear center so it can be set on a light base. 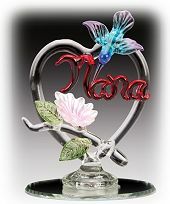 A Blue rainbow colored Hummingbird leans toward a hand written "NANA" in red lettering and a pink blossom under a clear glass heart. Set on a round beveled glass mirror base, it is bound to warm the heart. 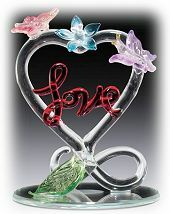 Use with a light base to make this glass sculpture extra special. 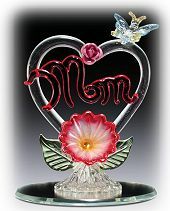 A charming blue butterfly hovers over a glass heart with red Mom letters in the middle, above a dazzling red Campanula Bell Flower set on a beveled round mirror. A gift sure to bring a smile to a Mom's face. Set on an LED light base for added effect. 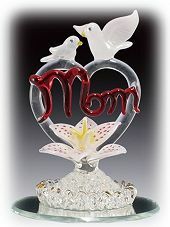 A hand crafted glass Dove and baby are perched above a frosted lily bloom with "MOM" etched over a sweet glass heart. This lovable sculpture is set on a beveled round mirror base with a clear center so it can be set on a light base. 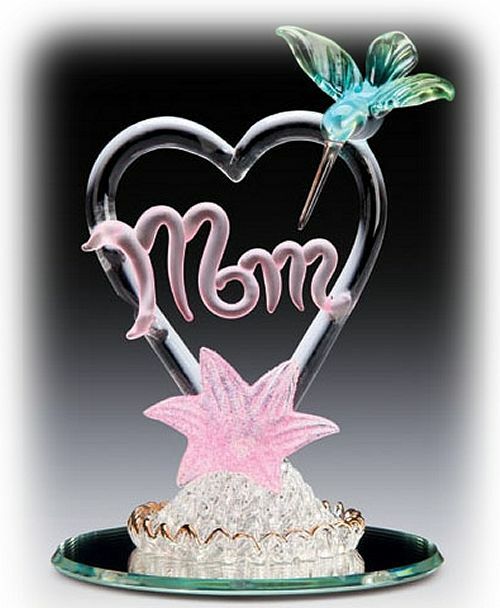 Delicate hand made spun glass figurine has inscribed MOM letters with a red outlined heart and an adorable Angel with gold halo accent, all set on an oval mirror base with beveled edge. A touching birthday present or loving gift. 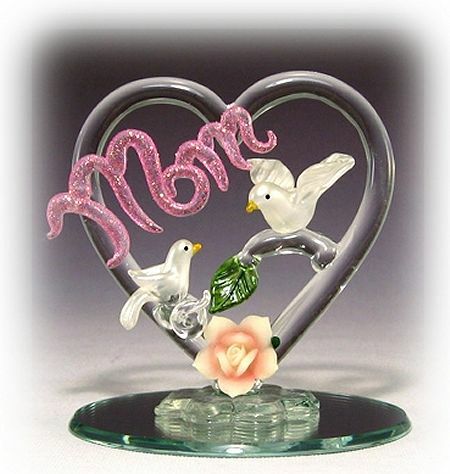 A beautiful white Dove with baby are perched over a porcelain look pink rose within a frosted pink "MOM" glass heart. Set on a round beveled glass mirror base, it is bound to warm the heart. Use with an LED light base for added effect. 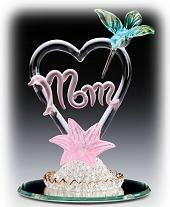 A delicate Blue Hummingbird hovers over a glass heart with pink Mom letters in the middle, above a frosted pink Star Flower set over a gold trimmed spun glass base on a beveled round mirror. A gift sure to bring a smile to a Mom's face. Set on an LED light base for added effect. Beautiful frosted white Doves are perched on Ruby Red "MOM" letters, spelled with a heart, within a glass heart that rises over a lovely pink pansy flower and can be used with an LED light base. Set on a round beveled glass mirror base, it is bound to warm the heart. 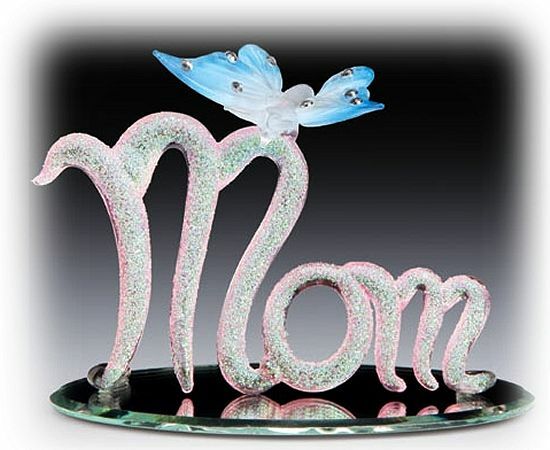 Delicate hand made spun glass inscribed pink outlined MOM letters with frosted center and a a translucent blue Butterfly with crystal accents, all set on an oval mirror base with beveled edge. A touching Mother's day gift or birthday present.